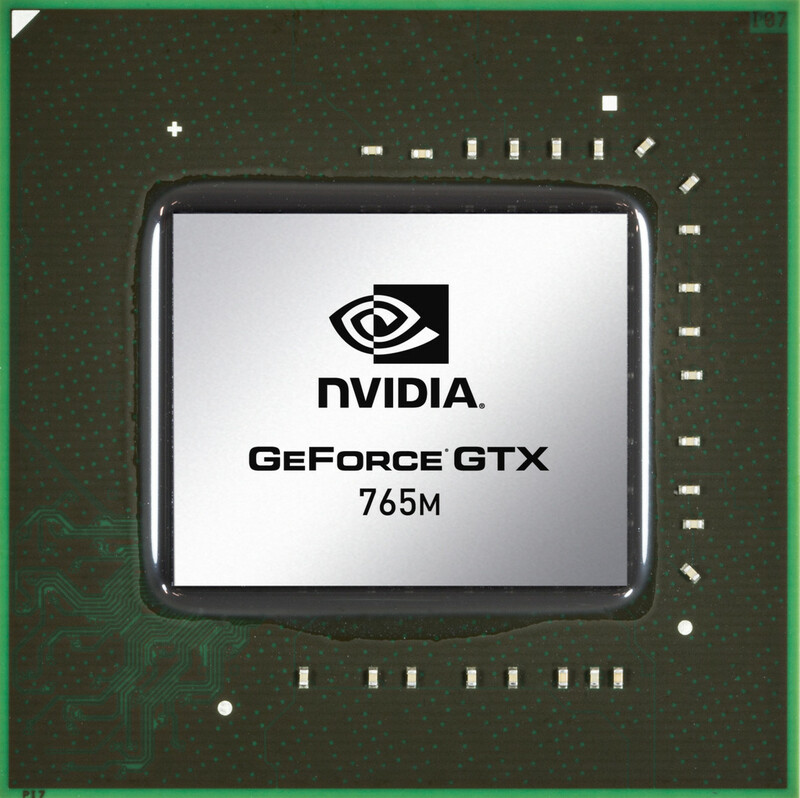 The NVIDIA GeForce GTX 765M is an upper mid-range DirectX 11-compatible graphics card for laptops. Compared to the GTX 760M, the 765M offers a higher core clock rate from the same GK106 architecture. As a novelty, the GeForce 700M series implements GPU Boost 2.0 to automatically overclock the core clock rate. Depending on the cooling headroom provided by the laptop and the application or game, up to 15 % performance gains are possible. The Kepler architecture is the successor to the Fermi architecture that first appeared in laptops with the GeForce 400M series. The GK106 Kepler core offers five shader blocks, called SMX, that are clocked at the same speed as the central core. In the GTX 765M, four blocks are active for a total of 768 CUDA cores. Although the Kepler architecture can utilize more shader cores than a Fermi chip, its shaders can be up to twice as power efficient. However, due to the missing hot clock of the shader domain, two shaders of a Kepler chip are of similar speed to one shader of a Fermi chip (as the latter is clocked twice as fast). The graphics performance of the GeForce GTX 765M is clearly above the GTX 660M thanks to the higher amount of shaders. The maximum performance may differ a bit depending on the cooling solution of the laptop due to better utilization of GPU Boost 2.0 on laptops with more effective cooling solutions. In our tests the average performance of the GTX 765M was above the older GTX 670MX. Demanding games like Metro: Last Light, Crysis 3, Far Cry 3 or even SimCity were playable in 1366x768 pixels and high detail settings at fluent frame rates. Older and less demanding games like Star Craft 2 however were playable in Full HD with all settings set to max. The feature set of the GTX 765M is identical to the GTX 670MX as both are based on the same GK106 core. Therefore the GPU supports up to 4 active displays. Furthermore, high resolution monitors of up to 3840x2160 pixels can now be connected using DisplayPort 1.2 or HDMI 1.4a if available. HD-Audio codecs, such as Dolby TrueHD and DTS-HD, can be transmitted via bitstream mode through the HDMI port. However, as most laptops will feature Optimus, the integrated GPU will likely have direct control over the display ports and may limit the feature set available by the Nvidia Kepler cards. The power consumption of the GeForce GTX 765M should be between 50 and 75 Watt (similar to the 660M and 670MX, respectively, according to rumors) and is therefore best suited for large notebooks (15-inches or greater) and desktop replacements.